It was no slick trick that Future Islands ascended in the wake of a late night talk show appearance. Front person Samuel T. Herring was ready to writhe and roar across the stage then, and remains one of the most compelling front-people four years later. To compare Herring's presence to the that of most other contemporary singers would be like comparing an unhinged Baryshnikov to those inflatable tube dancers outside used car dealerships and discount carpet stores. Whether by default or design, the intensity Herring brought to Future Islands' performance at Union Hall in Edmonton was as visceral and earnest as it was captivating. Starting the set with "Ran," from their most recent album The Far Field, the rest of the band acted as the anchor point to Herring's wild antics and sacrosanct command of the stage. Michael Lowry's four-on-the0floor beats set the pace while William Cashion's bass lines drove the melody that lifted Gerrit Welmers thick synths to both floors of the Thunderdome-shaped round room. By far, "Seasons (Without You)" elicited the loudest crowd reaction, and although the sound was at times muddy, every time Herring lowered his brow or furrowed his forehead to signal an earnest moment, the crowd leaned in. When he apologized on behalf of the band for taking so long to make it up to the city, the crowd instantly forgave. By the time he gripped the air with a muscular fist during "Doves," the audience was planted firmly in the palm of it. When they reached "Before the Bridge" as a skittering denouement, it was as if they were throwing strings of firecrackers into a goldfish bowl. Following a brief break, they then returned for a well-rounded three-song encore, ending the night's send off with "Little Dreamer." Future Islands found a sonic formula early on in their 13-year career and haven't deviated far from it, so in some senses it would be interesting to hear what a corner turn would sound like for the band, but it was by no means unrewarding to see them in their current form for their first time in Edmonton. Much has been, and will continue to be, said about Future Islands' appearance on David Letterman in 2014. 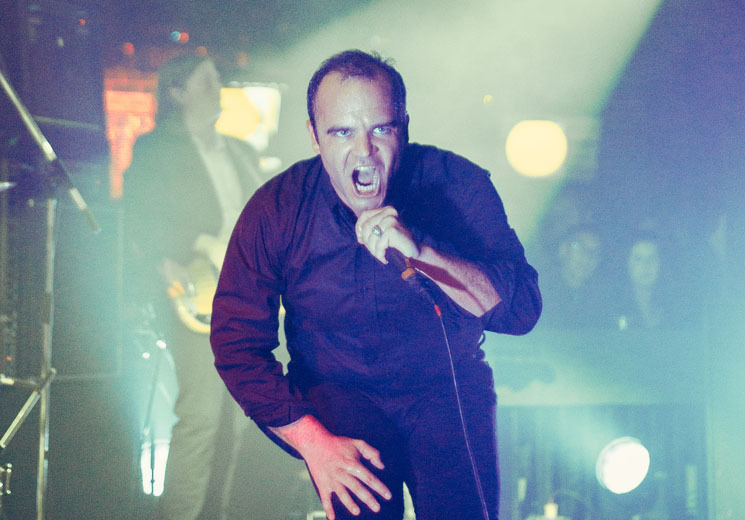 That Future Islands were booked to play Letterman at all, and turned the virally epic performance into a career of soldout shows across the globe ever since, is like the proverbial turtle on a fencepost; they didn't get to where they are by accident. Hear BADBADNOTGOOD Join Forces with Future Islands' Samuel T. Herring for "I Don't Know"